Out on Auditory Cortex Records as the previous two releases, "Metaverse" EP and the "We will eliminate" single, HYBRID ENZYMES is the latest one by MetaComplex. Coming from Budapest, Hungary, Tamas Olejnik is the man behind MetaComplex and he's also active with the Antendex, Dublicator and Retax Gorgon monikers. The release contains three version of "Hybrid Enzymes": the original tune, the one remixed by Digitizer (they recently released "Computer Controlled", always on Auditory Cortex Records and you can find here on CHAIN D.L.K. its review) and the one remixed by DVS NME (they released a month ago their debut release but on the Greek label Binalog Productions). "Hybrid enzymes" is very cool track which blends rich robotic rhythms, melodic pads and bleeps and mysterious atmospheres. Anyone named Dopplereffekt? Well'Â¦ they aren't their copy but they shared the same laboratory where they experimented with sounds. Digitizer for their remix decided to keep the main melodies and to add an acid touch on the rhythmic lines, while DVS NME opted for keeping the bit of mystery adding an electro flavor thanks to syncopated drums, some new melodies and a bouncing intermezzo with bass enhanced lines. The track is really nice and remixers didn't change it drastically, they rather personalized it. One of the drawbacks as an independent music reviewer for Chain D.L.K. is that new CDs to review usually come in a lump-sum package, mostly when enough have accumulated at the Urselli address to ship, and often some time after their release date. So it is either feast or famine; no new releases to review, or LOTS of new releases to review. Like all Chain D.L.K. reviewers, I do this not for the money (because there isn't any! ), but for the love of the music, and the opportunity to expound on it. The free CDs aren't a bad perk either for expanding my music library. As this isn't a J-O-B, my (free) reviewing time is limited to what I can accomplish in spare time when I'm not working making a living, which seems to consume most of my time. Fortunately, I have the ability to listen to new releases while I'm working, so at least there is time for the music to simmer in my psyche before I get down to writing about it. The reason for this little preamble has to do in some way with why this review is so far from the release date of October 25, 2010, interned as a Halloween promotion. Of course, there might be some Chain D.L.K. readers that believe every day is Halloween to some extent, and the timeliness hardly affects them. But this is not a 'Halloween CD' in spite of the October 31st promotion. This is one interesting little excursion in the realm of Dark Ambient. The artist known as Synoiz is one Graeme Donaldson from Sunderland in the North East of England. Originally setting out to create his own brand of angst-ridden synthpop, Synoiz found himself much more involved in ambient soundtrack work. Synoiz cites game soundtrack composers Matt Uelmen (Diablo, Warcraft, Starcraft), Steve Henifin (Blood Omen: Legacy of Cain, Eternal Darkness: Sanity's Requiem) and Masami Ueda (Resident Evil 2 & 3) as some primary influences on what is done here, but since I don't play computer video games, I have little frame of reference in that regard. However, I DO know quite a bit about Dark Ambient music having an extensive collection of it, numerous reviews of Dark Ambient artists here at Chain D.L.K. to my credit, and have dabbled in the genre as a musician myself. I'm not sure that 'Shock! Horror!' is an appropriately descriptive title for the music on this maxi-single CD. When I think of shock and horror, I tend to over over-the-top jarring, hair-raising or even gruesome images and possibly painful musical events. (Megaptera come to mind; so does Brighter Death Now, and a host of others.) This stuff is a lot more subtle than that. Macabre, unsettling, eerie, spooky all come to mind when listening to this Synoiz release. Although two of the tracks on this CD are remixes of the ('Shock! Horror') title track, they only bear a passing resemblance to each other with some elements. The title track kicks off the CD with a bit of a low drone tone, an unearthly processed ghostly voice, some extended low, murky piano notes and a repeating pattern of chalky, slightly abrasive pitched synth noise, and other vaguely spirit-like howling, as well as very subtle intermittent percussion that will emerge more prominently in subsequent tracks. Perhaps the most overt of all music on the CD, there is still a creepy subtlety to it that does not overwhelm, but does immediately immerse you in a nightmarish mood. Track 2, 'Indrid Cold' gives the impression of receiving radio transmissions from the dead, as it begins with radio frequency twiddlings giving way to unintelligible (processed) voices and other sonic effluvia. About a minute and a half into it, a pulsing bass is introduced along with minimal metallic tapping percussion. A deep processed string line is the only real melodic content here. Things warp, the metallic percussion turns into light hammering and before you know it, it's over. A curious piece. Track 3, 'Shock! Horror' (Sinister Mix) begins with the sound of thunder and low moody strings before the ghostly moaning voice and the repeating pattern of chalky, slightly abrasive pitched synth noise are reintroduced. Other voices (a mournful woman crying, an unearthly bird, spirit moanings) appear and subtle percussion gives way to heavier, more defined ritualistic percussion for a while. It could have gone on longer and built up more suspense into some type of climax. Kind of like wine-tasting; when you find one you really like, you want the whole bottle, not just a sip. Last track, 'Shock! Horror' (Acoustic Edit) has a neoclassical aura about it with its string themes, piano rumblings and more spirit voices moaning in anguish. The percussion that was sparse and intermittent on the first track is given a little more play here. The overall effect is incidental soundtrack music for a very bleak film. I found it interesting that each time I listened to the CD, it sounded a bit different. There are things you will pick up on subsequent listening after the first, and it is brief enough to dive right back in again to see what you missed. To me, this seems more of a sampler of what Synoiz is capable of, and hopefully a new full CD of this type of music might be forthcoming from Synoiz in the near future. If you go to Synoiz's website, you can get a free digital download of this music if you sign up for the newsletter. Synoiz is a project to watch as the music here is indicative of an artist to be reckoned with in the field of Dark Ambient. Well this came as a surprise! Have you ever seen the Tarkovsy films ' 'Solaris,' 'The Mirror, 'Stalker'? Well if you have, then you've heard some of the music of Edward Artemiev. But Artemiev is not just a soundtrack composer; he is an acknowledged leader of Russian electronic music. His credentials in synthesized music go way back to meeting with engineer Eugene Murzin - one of the first in the world to invent a synthesizer around 1960. Artemiev's compositions written in the 60s-the early 70s belong to the aesthetics of avant-garde, and since then he has many releases to his credit, both symphonic and electronic. (Hard to find in the U.S. but many available through Electroshock.) 'Mood-Pictures' contains mostly pieces from a number of his film scores, some utilizing the State Orchestra of Cinematography, and others just by Artemiev and an occasional guitarist or vocalist. This CD is an incredible introduction to Artemiev's work, so rich and varied in themes, and magnificent in its execution. The first track 'Siberiada' (title track from the 4 part epic motion picture of the same name directed by Andrei Konchalovsky) sounds archetypically Russian as the theme builds with low strings and woodwinds and a martial cadence. I found it Morriconesque, especially the voices, and when the horns came in. It has a definite 70s sound as it is from 1979. The next two tracks are also from the film, but showcasing Artemiev's synth work. 'Swing' is a bit of very nice ethereal synth ambience, while 'Fire' is sequencer-heavy chaos with a stinging guitar overlay. This was my least favorite track on the album, but the pyrotechnics are impressive. 'Looking After the Victim' comes from a movie titled 'A Butcher' and it is a mysterious mood piece that begins with a Twilight Zone-like atmosphere that morphs into a medium tempo low synth sequence with the eerie strains of high strings. On 'Kamchatka ' Grand Voyage' (from the movie 'Mammon') Artemiev's synths play off the orchestral background developing a beautiful and memorable theme with flute and guitar string sounds as well as other sonics including unearthly voices. 'Fox Hunting' (from the movie of the same name) has Artemiev treading into Tangerine Dream territory, but with a sequencer-driven intensity and verve I've never heard from those guys. 'Premonition' comes from the film 'A Driver for Vera,' a romantic Cold War psychological drama, and the music here fits the description perfectly. 'Polygon' (from 'Rainbow Moon') sounds very prog-rocky at first with drums and elaborate synth work that eventually builds into a moody interlude before meandering off into other tangential expressions. A film called 'Requiem' is the source of 'Credo,' a heavy, Phantom of the Opera-like piece with uber-dramatic and spooky synths. The next three tracks are from the motion picture 'The End of Eternity'. 'Aria' features haunting voices that are sure to send shivers down your spine. One of my favorites on the CD, and a composition of pure genius! 'A Road to Nowhere' is an electronic extravaganza with plenty of tension and so much going on it's hard to describe. 'The Well of Eternity' reminds me of 'Mars' from 'The Planets' by Holst, yet is more modern and spacey, but no less ominous. 'Lullaby' is from the film 'Night of a Birth' and features 'Hearts of Space' style synths with some beautiful orchestral backing. Almost Tomita-ish. 'Serenade' is from the movie 'Facet,' and it is a lush track with synth-sax doing the melody with orchestral synths, electric bass and drums. I don't know why, but I was reminded of the Vangelis 'Blade Runner' soundtrack on this one. Romantic, yet dramatic; very 80s. The next two tracks, 'Dialogue with a Computer,' and 'Vocalize' come from a movie called 'By the Eyes of the Wolf'. The former is kinetic and sequencer-driven, while the latter sounds classically inspired and romantic with a wonderful wordless solo vocal by Tatiana Kuindji. 'Top of the World' is from the animated film 'Legends of Peruvian Indians' with thick pipe organ and heavenly synth voices and other synthesizer embellishments. Awesome. Final track 'Peregrini' is an excerpt from Artemiev's 'Symphony,' again with vocal by Tatiana Kuindji. It is a somewhat understated piece with Kuindji's soprano voice playing hauntingly off synthetic voices over a muted low tone sequenced background. Atmospheric incidentals such as chimes strings, pads, and other synthesizer tones and washes fill in the gaps and heighten the drama. Amazing stuff. As good as all this is, and believe me, it is really, really good; as a complete album it lacks unity. Then again, it was only intended as a diverse compilation of the artist's film work, and on that level, it succeeds. I highly recommend this CD although you may have to go out of your way to obtain it if you're from the U.S. (U. S. distributor source noted) but it is well worth it. It also wasn't easy finding his MySpace site (the only thing close to the artist's website outside of Electroshock Records, and not updated since 2006) as the spelling of his name there was different, but there is so much about Artemiev on the net that you shouldn't have a difficult time finding plenty on him elsewhere. Interesting, that a 'delicious' cover artwork featuring ripped open female bodies and an obvious doze of cannibalism doesn't get censored in the Metal music genre - and only in this genre. However, that isn't the point. The French madman Remzi Kellici has at least left nearly all elements, which made him known in the EBM/Electro-genre. Already his last DCD album released by the in hiatus remaining Arkansas-based label BLC Productions, 'Erection Body Mutilated' has shown straight into this new direction, so this new album doesn't surprise musically too much. Also the track list speaks for itself, or how would you rate titles like 'How To Become A Killer With A Granny Dress'? This isn't stuff for the faint-hearted listeners. Be it SKREW, 16 VOLT, CLAY PEOPLE, MINISTRY, they all can be taken as possible references for Remzi and his new music style. Additionally he has hired a real band and tours the world - therefore it makes quite sense to sign with the German label and mail-order service Twilight, as this should be able to take care for a better financially background. 'Symphony Of Decay' is a raging hurricane featuring assaulting guitar riffs, monstrous vocals and a straight rhythmical, mostly still with a drum-computer supported outfit. The still Industrial-related components in Remzi's latest work can be noticed with several voice samples mostly with drastically background indiscriminately thrown in - and, thanks God - with the very few tracks still relying on Electronica components ('Zodiac', 'Secret Graveyard in The Garden'). I guess it isn't a secret, that I would prefer a more balancing kind of production, which doesn't reduce the Electronica elements to a minimum - as I think, that Remzi has his talent into this kind too. However, I understand his motifs. Whole life is Rock 'n' Roll, isn't it? Deviant UK is the project of Jay Smith, and "very.bad.things" is the follow up to "Barbed Wire Star" which was released in 2006. 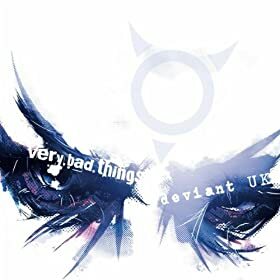 "Barbed Wire Star" established Deviant UK as one of the top UK industrial and alternative electro artists in a short space of time, so 'very.bad.things' has a lot to live up to. The most striking thing about Deviant UK Initially, is the vocal sound of Jay Smith, which has strong similarities to Gary Numan's, with perhaps some subtle, grittier variations to his arsenal. However, this is no tribute act, and within a few minutes of listening to the album, you come to realise that Deviant UK definitely have their own sound going on. The production is an improvement on the already strong standard present in their last album, with majestic pads soaring, rhythm sections pulsing and some carefully sculpted distortion all weaving together to form a solid foil from which the distinctive vocals can launch. Much like the production, Jay's vocals have improved, with whispers, low grumbles and even a little snarl added in parts, showing that the progression of the project is clearly a key driving factor behind the sound of Deviant UK. The themes on this album are very direct and aggressive compared with previous offerings, and you get the sense that Deviant UK are expanding into something much more dynamic, capable of a greater breadth of song, musically, lyrically and thematically. This aggression helps give "very.bad.things" more of an edge than "Barbed Wire Star" with more of a sense of being on a musical journey as opposed to a series of tracks. When paired with the fact that the tempo on most tracks is fairly brisk, with crisp 4 to the floor beats pushing the album along, it is very easy to get swept away and lose yourself. This album is literally laden with Pad driven hooks, and catchy melodies, and is definitely closer to VNV than Combichrist in terms of the Industrial Spectrum. If you enjoy the 80's synth classics like Gary Numan and Depeche Mode, or the more contemporary stylings of VNV Nation and Assemblage 23, you will find something to enjoy on this record. If however your tastes are for the more aggressive, you may be better suited looking elsewhere, as Deviant UK is definitely a project with an eye for a clever melody,rather than a penchant for Distorted vocals. All in all, a definite improvement on "Barbed Wire Star", and a progression of Deviant UK in terms of production, songwriting and dynamism, resulting in an album full of hooks and toe tappers.